For me, pizza and football go hand in hand. A homemade pizza is the perfect accompaniment for a lazy Sunday evening of football watching. 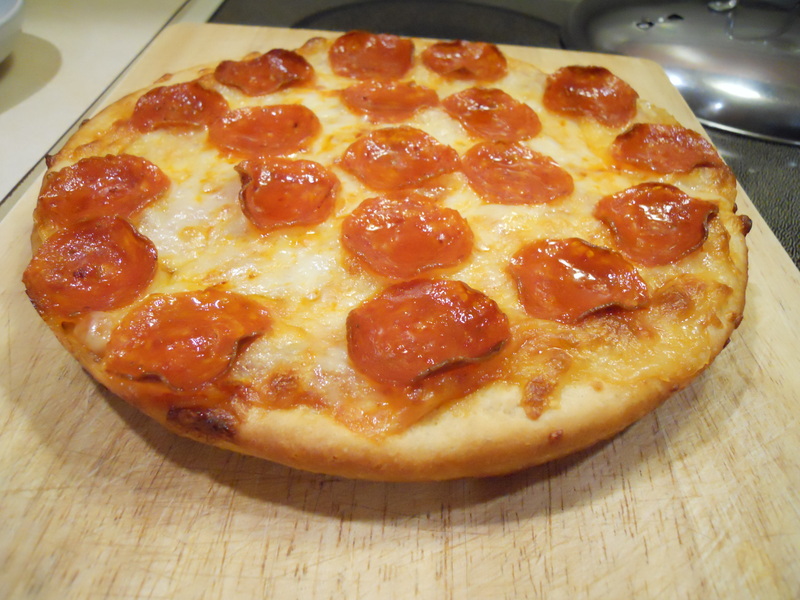 I usually make a traditional New York-style pizza, but when I ran across this recipe I knew I had to try it – my husband has a huge soft spot of Pizza Hut. This wasn’t as dead-on as some copycat recipes I’ve tried, but it’s a great approximation to make at home. We really enjoyed it. Put yeast, sugar, salt, and dry milk in a large (2 qt.) bowl. Add water and stir to mix well. Allow to sit for two minutes. Add oil and stir again. Add flour and stir until dough forms and flour is absorbed. Turn out on to a flat surface and knead for about 10 minutes. Divide dough into three balls. In three 9″ cake pans, put 3 Oz. of oil in each making sure it is spread evenly. Using a rolling pin, roll out each dough ball to about a 9″ circle. Place in cake pans. Spoon 1/3 cup sauce on each pizza dough and spread to within 1″ of edge. Distribute 4 oz shredded mozzarella cheese on sauce and add on any additional toppings you want. Bake for 20-25 minutes, until cheese is bubbling and outer crust is brown. I’ll right away grab your rss as I can not find your email subscription link or newsletter service. Do you’ve any? Please let me know in order that I may just subscribe. Thanks.